Most cars today are driven as appliances built for commutes, family trips, and emergency trips to the bookie. However, some cars are a testament to their owner’s sense of style, or lack thereof. Case in point: This cheap, uniquely modified Pontiac GTO, that may need some cosmetic deconstruction. 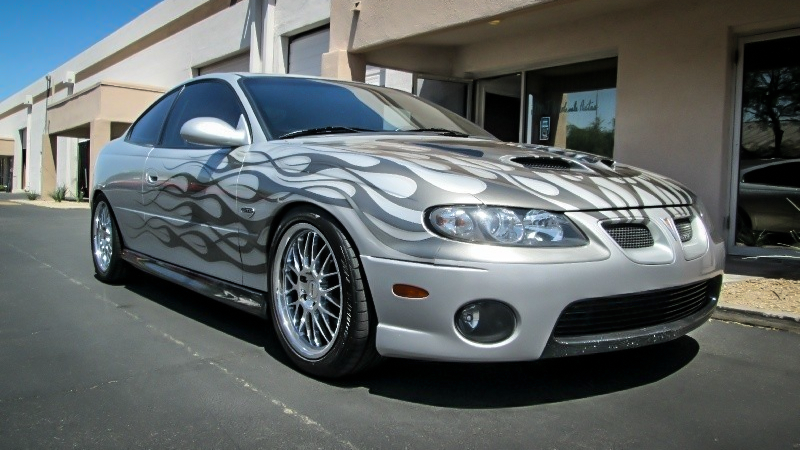 This 2005 Pontiac GTO is a contender for one of the sleekest-looking modern muscle cars ever. Its Australian origins lend itself to a 21st-century design with a tried-and-true V8 powerplant with a basic design that was unchanged for more than half a century. This car in particular has a few go-fast goodies that the seller says get it to just shy of 500 horsepower on the dyno. While I do call that claim into question, it’s not completely unreasonable. The cosmetics of the car, however, would need to be addressed, and it’s likely the reason that this car is so ridiculously cheap for a car of this age and mileage, at a current high bid of just over $6,000 with a clean vehicle history report. This incredible car features a custom LS2 under the hood with loads of upgrades including Volant Cold Air intake, F.A.S.T. fuel system, Accel Coils, Taylor 409 Race Wires, Moroso catch can, Kooks headers, high flow cats, and a full Borla Exhaust system, this car sounds great and on the dyno it made just shy of 500HP! This thing is a blast to drive. The custom work continues with the paint, the hood, front fenders, doors, and bumpers all feature some incredible air brush work done by Bad Boy Designs that includes 3D flames and that one of a kind goat on the hood that really has to be seen. The body is nice and straight, but the silver paint is starting to fade on the roof. This car comes with a clean Car Fax and it has been in Arizona it’s whole life so there is NO RUST. It’s a car that would be a great 1/4 mile track star, especially with its consistent automatic transmission. It’s also a great cruiser with a buttload of power on tap and a killer exhaust note. If you could get some money together to de-mod the car (or at least take the “GOAT” embroidery off the seats), it would be a serious performance bargain at double the price. Get it before someone adds to its “charm”.